TARRYTOWN — Eighty-three-year-old Lila Ogman stepped up to a podium last week at what felt to her like the Oscars. It wasn't the world's most glitzy affair — a hotel luncheon honoring 36 senior citizens from Westchester County — but it was a chance for Ogman to give her thank-you speech. "I have received just as much as I have given," said Ogman, a former preschool teacher from New Rochelle, during the 2009 Senior Hall of Fame ceremony. In 1993 she helped create the education program Learning in Retirement at Iona College. The program has 300 members and a volunteer faculty teaching jazz, art, writing and other subjects. Ogman leads book discussion groups. "I have discovered skills I didn't know were present deep inside me," she said. The 2009 Senior Hall of Fame ceremony gave official recognition to seasoned volunteers, particularly those helping fellow senior citizens. They are nominated by members of the community. More than 500 people came to applaud the honorees Friday at the Westchester Marriott Hotel. Special honors went to Ogman along with a retired social worker from Elmsford, the head of Meals on Wheels in White Plains, and a retired podiatrist who helps fellow seniors learn about Medicare. Dr. Arthur Wolstein waved his cane in the air as he approached the podium when it was announced that he had just turned 95. He quoted John F. Kennedy: "It's not the amount of years we live in our life, but the amount of life we bring to those years." Wolstein, who lives in New Rochelle, speaks about Medicare regularly at the White Plains Senior Center. He is past chairman of the Visions Summer Camp for the Blind. "I feel like the most blessed person in the universe," he told the audience, describing his wife's "huge heart" and his four children. "I will never walk alone." Lola Hunter, who spent 31 years with the county Department of Social Services, thanked everyone from church members to the Greenburgh town attorney to her bowling team. Listing the organizations that she had worked with over time, she urged the audience to get involved with the community. "Volunteer," she said. "The world will be a better place, and this journey will not be in vain, because you cared." Evelyn Stock, 71, was recognized for her work with the League of Women Voters and her leadership of the Westchester County Fair Campaign Practices Committee. A Scarsdale resident, she also provides scholarships to young women in honor of her late husband, Howard, who was a psychiatrist. 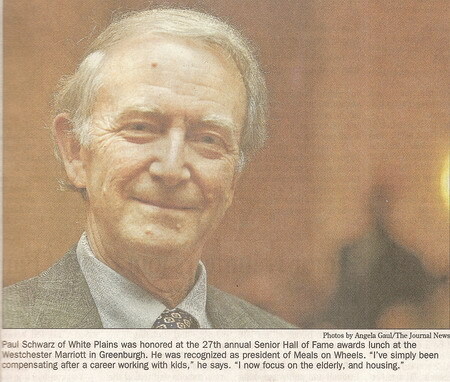 Paul Schwarz, who taught English and public speaking to children in Scarsdale, Tarrytown and Bedford, was recognized as president of Meals on Wheels in White Plains. "I've simply been compensating after a career working with kids. I now focus on the elderly and housing," he said. He recalled his rabbi once giving out a list of 18 service organizations and asking the congregation, "Choose one. Do something." The day before the luncheon, he began mentoring a fifth-grader at a local school. Mae Carpenter, commissioner of the county's Department of Senior Programs and Services, said the event provided a needed break from the pressing issues of war, the recession and the national health care debate. "You can feel it in the air," She said. "People needed some form of affirmation." The Senior Hall of Fame began in 1982 and now has 836 inductees. Pleasantville: Sal J. Rubino, R.Ph. Scarborough Manor: Allan S. Mohl, Ph.D.